Recent years have seen a great progress in the area of robotics. Communication signals are also ubiquitous these days. In this talk, I will explore the opportunities and challenges at this intersection, for robotic sensing and communication. For instance, imagine two unmanned vehicles arriving behind thick concrete walls. They have no prior knowledge of the area behind these walls, but are interested in imaging every square inch of the invisible area through the walls with a high accuracy. Can the robots achieve this with only WiFi signals? In the first part of the talk, I will show that this is indeed possible. I will discuss how our methodology for the co-optimization of path planning and communication has enabled the first demonstration of 3d imaging through walls with only drones and WiFi. I will also discuss other new sensing capabilities that have emerged from our approach, such as occupancy estimation and crowd analytics with only WiFi signals. In the second part of the talk, I will focus on communication-aware robotics, a term coined to refer to robotic systems that explicitly take communication issues into account in their decision making, in order to enable robust connectivity and networked task accomplishment. This is an emerging area of research that not only allows a team of unmanned vehicles to achieve the desired connectivity during their operation, but can also extend the connectivity of the existing communication systems through the use of mobility. I will then discuss our latest theoretical and experimental results along this line. I will show how each robot can go beyond the over-simplified but commonly-used disk model for connectivity, and realistically model the impact of channel uncertainty for the purpose of path planning. I will then show how the unmanned vehicles can properly co-optimize their communication, sensing and navigation objectives under resource constraints. This co-optimized approach can result in a significant performance improvement, as we shall see in the talk. I will also discuss the role of human collaboration in these networks. Yasamin Mostofi received the B.S. degree in electrical engineering from Sharif University of Technology, and the M.S. and Ph.D. degrees from Stanford University. She is currently a professor in the Department of Electrical and Computer Engineering at the University of California Santa Barbara. 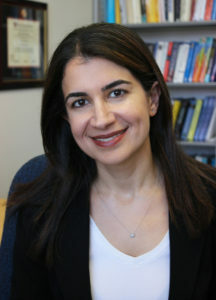 Yasamin is the recipient of the 2016 Antonio Ruberti Prize from the IEEE Control Systems Society, the Presidential Early Career Award for Scientists and Engineers (PECASE), the National Science Foundation (NSF) CAREER award, and the IEEE 2012 Outstanding Engineer Award of Region 6 (more than 10 Western U.S. states), among other awards. Her research is at the intersection of robotics and communications, on mobile sensor networks. Current research thrusts include X-ray vision for robots, communication-aware robotics, human-robot networks, occupancy estimation, RF sensing, and see-through imaging. Her research has appeared in several reputable news venues such as BBC, Huffington Post, Daily Mail, Engadget, TechCrunch, NSF Science360, ACM News, and IEEE Spectrum, among others. Yasamin is currently an associate editor for the IEEE Transactions on Control of Network Systems. She has served on the Control Systems Society conference editorial board 2008-2013.